The first thing that drew me to Bruno was his sense of humour. After all, you don't usually fall out with someone you can share a joke with. What I didn't note immediately was his excellent command of English. Now, of course, you really can't choose an architect just because you can have a laugh together. So what else can I tell you about Bruno? Well, physically he is typical of many Portuguese; medium height, slight of build and dark haired. Look! 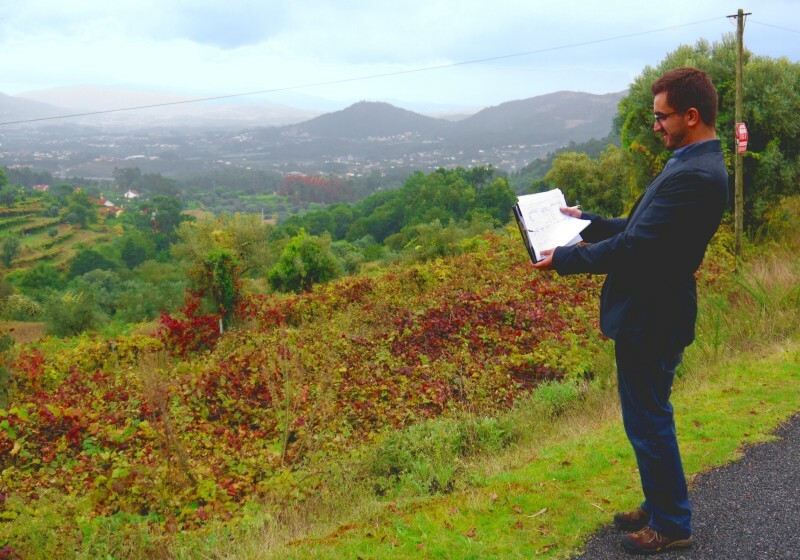 Here he is on a cloudy autumn day lining up his plans with the features of our plot of land. He is also pleasingly keen to interpret our ideas and wishes. After the first couple of architects we met, this was a relief. The first one was full of gadgets - electric motors, for example, to open and close blinds fixed between the layers of double glazing or to draw the curtains. To us this seemed like a sure-fire way of spending a lot of money both to install them and then to mend them when they went wrong. Neither of us is infirm and we are perfectly capable of closing curtains all by ourselves! We supposed that he thought that as foreigners we were wealthy dilettantes rather than ordinary folk who just happen to be in love with Portugal. We also imagined that, if we allowed ourselves to be seduced by his exotic ideas, we'd soon get fed up of finding ourselves unable to draw the curtains because we'd lost the remote control down the back of the settee or we'd discover we'd picked up the wrong remote and turned on the TV instead of closing the blinds! The second architect had little or no interest in what we wanted to build. He announced that if he couldn't build what he wanted to build then he wasn't interested: he would find it hypocritical to build something that he didn't care for! We, on the other hand, didn't much care for the fact that his own house was clad in metal of variegated colours rather like a rusty shipping container. We didn't want to look as if our house had fallen off the back of a transporter lorry. We worried too that people would burn their fingers on the metal walls during a hot summer. I can't help wondering how he's been getting on during the recession. So Bruno has been a pleasure to work with, full of ideas and able to share his plans with us over Skype when we've been away. After a while we discovered that he spent his childhood in the United States which means that his command of English is excellent. Even though my Portuguese isn't bad, I have to admit that my ability to discuss cross-sections of plans, different kinds of plumbing or electrical circuits is decidedly limited. 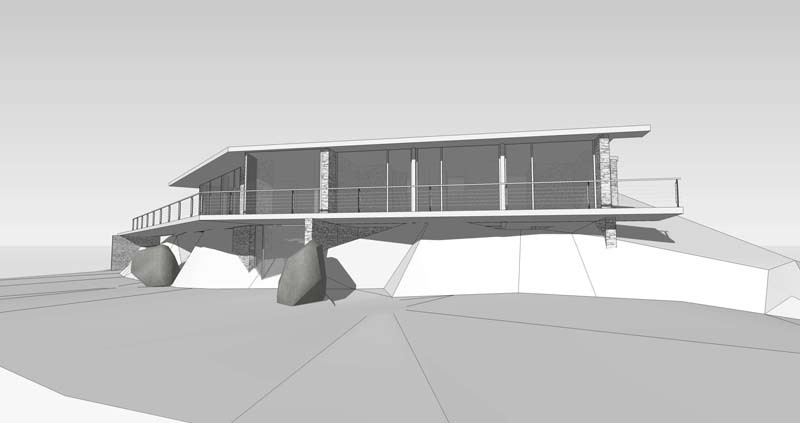 You've probably seen some of the plans for our house in a previous post: 'Our house: a spectacular view to wake up to'. 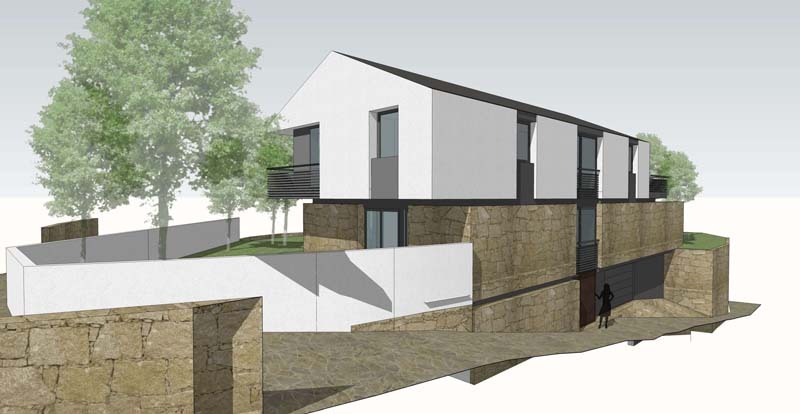 Here is the plan of a near neighbour's house designed by Bruno. This one, as you can guess, also has a wide view over two directions and huge windows through which to appreciate it. But Bruno is not just the architect of houses with views. He can design houses in villages that fit into small plots. 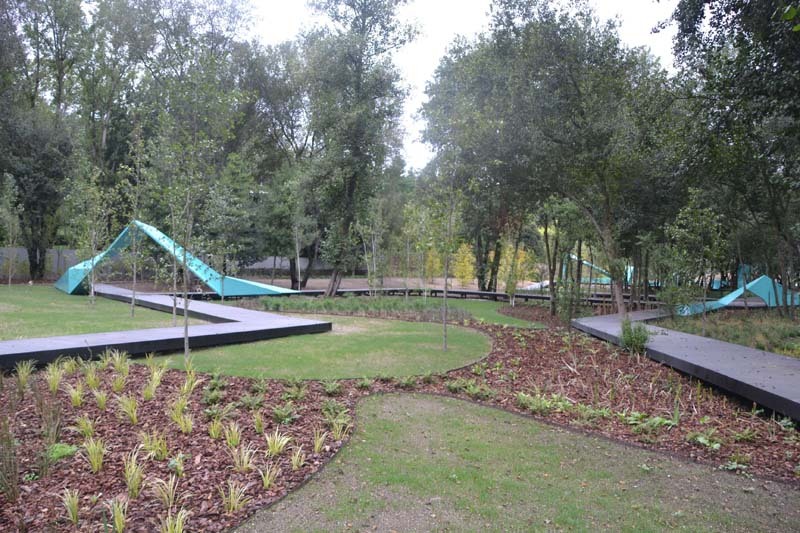 And in collaboration with a landscape architect, he won a competition to provide a new park. We have encountered a couple of hiccups on the way to getting our building licence but neither has been Bruno's fault. In fact, he has helped us through them with the local council. Now for the builder! Have you built a house in Portugal? How did you get on with your architect and builders?